Located in the pastoral tract of land between Lightcliffe and Norwood Green, just down the road from Coley, the community of Priestley Green is a remarkably serene locale, its sense of repose only ever disturbed by the thrum of the 4x4s which seem so popular in this disproportionately affluent district. There is a distinct sense of place here. Perhaps it is simply a reflection of the relative lack of population density compared to surrounding areas. Or perhaps it is an atmosphere which has always been felt here, an atmosphere of sanctity which led a community of monks to settle here in the early Middle Ages and provide it with its name. Perhaps it had been regarded as a holy place long before that even, a conclusion which might be drawn from the concentration of holy wells in the vicinity of the hamlet. The first and most imposing of these is Helliwell Syke Well (which means “holy well by boggy land”) where a spring feeds a series of four troughs adjacent to Syke Lane as it approaches Priestley Green from Lightcliffe. It is set amidst a profusion of ash-trees, which are often associated with sacred waters. There has been evidence of a well at Helliwell Syke since Saxon times according to J. Horsfall Turner’s 1893 History of Brighouse, Rastrick & Hipperholme. By 1373 the Wakefield court rolls record that a nearby settlement of the same name had been abandoned following the enclosure of the site by Henry de Bentley. However, the well was clearly important enough to have remained in common use after that time. Indeed, it was clearly still utilised in the 19th Century when the trough complex seen today was constructed. The second site is set into the pavement in the centre of the hamlet and is known as Lister’s Well or more simply just as the Holy Well. Less is known about this and some writers on the subject have speculated as to whether this well and Helliwell Syke have been conflated in the literature over the ages. However, a 1904 reference records that it was believed to “possess magic cures for all who drank its crystal waters, and pilgrimages were made to it”. Meanwhile, the fact that it has been retained as part of the structure of the pavement when so many others holy wells (such as Alegar Well or a holy well recorded at Woodhouse Lane in Rastrick which appears on Ordnance Survey maps until 1938) were simply tarmacked over suggests that some memory of its importance survived. 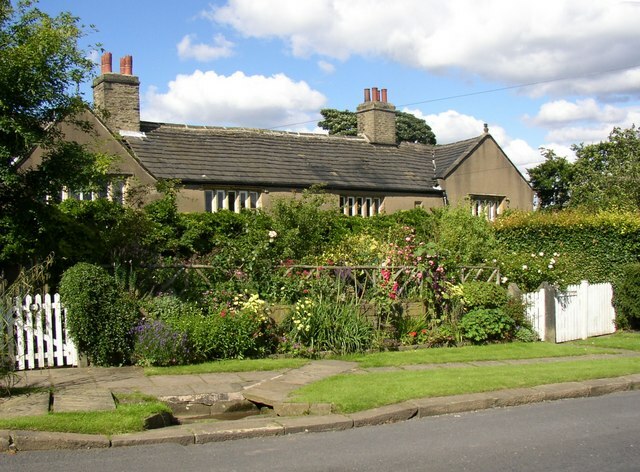 The third example – St. John’s Well – is technically at Coley but still lies within the same square mile, whilst the history of Priestley Green and its neighbour are possibly connected. The story of Coley will be explored more fully in a subsequent entry on Coley Hall but it is germane to mention here that between the 13th and 16th Century the tenure of the land was held by the Knights of St. John of Jerusalem also known as the Knights Hospitaller. As their name suggests, John the Baptist was their patron and this is reflected in the dedication of the church at Coley today and of course, St. John’s Well. There are also suggestions that the Knights’ actually founded a priory at Coley and whilst there is no archaeological evidence for this, it would certainly tie in with the tradition of a monastic community at Priestley Green and its abundance of holy wells. A more recent tradition concerning Priestley Green pertains to the Sisters’ House, which stands directly behind Lister’s Well. A dwelling on this site is recorded as far back as the 13th Century but the current cottage was built in 1630 by Samuel Sunderland of nearby Coley Hall. Local legend says that it was once home to the Appleyard sisters who for want of a place to worship nearby decided they would found a church themselves. However, they disagreed over precisely where it should be located so they built one each, Coley Chapel and Eastfield Chapel, with the house supposedly exactly half-way between the two. The story is doubtless intended to explain how two chapels came to be built so close together but it is demonstrably apocryphal as the chapels were built in 1529, a whole century before the Sisters’ House.